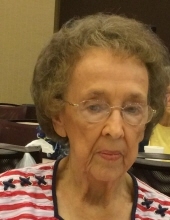 Nora Payne, 88, of Frontenac, Kansas passed away Sunday, January 13, 2019 at her home with her family by her side. Nora Payne was born September 1, 1930 in Capaldo, Kansas the daughter of Tony Cussimanio and Nora (Lance) Cussimanio. She grew up in Capaldo and attended Capaldo Schools. On September 17, 1947 in Evanston, Wyoming she was united in marriage to James O. Payne and he preceded her in death October 4, 1999. She enjoyed playing cards and going to the casino. Her favorite hobby was winning at the many bingo places throughout the 4-state area. Nora was a homemaker and will be remembered as a loving and devoted mom, grandmother, great grandmother and friend. Survivors include her children, Gay Grisham and her husband Kent of Pittsburg, Kansas, Marty Bedene and her husband Bruce of Arma, Kansas, Sandy Burton and her husband Roger of Pittsburg, Kansas, Jim Payne and his wife Marla of Frontenac, Kansas, Michelle Scott of Alaska, siblings, Bert Cussimanio of Utah, Loretta Masinter of Walnut Creek, California, Bernice Shepherd of Livermore, California, 13 grandchildren, 17 great grandchildren and 6 great great grandchildren. She was preceded in death by her parents, husband, granddaughter, Stephanie Payne, 1 sister and 5 brothers. Mass of Christian Burial will be celebrated 11:00 A.M., Wednesday, January 16, 2019 at Sacred Heart Catholic Church with Father Bob McElwee, celebrant. The family will greet friends from 10:00 A.M. until service time at the Church. Interment will immediately follow the service at Garden of Memories Cemetery, Pittsburg, Kansas. In lieu of flowers memorial remembrances are suggested to St. Jude Children’s Hospital and they may be mailed to her grandsons funeral home: Wickham Family Funeral Home, 510 North 7th, Fredonia, Kansas 66736. To send flowers or a remembrance gift to the family of Nora Payne, please visit our Tribute Store. "Email Address" would like to share the life celebration of Nora Payne. Click on the "link" to go to share a favorite memory or leave a condolence message for the family.